I love to watch Laura play. 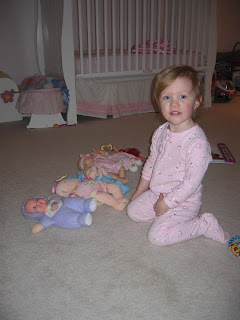 Lately, she has been into taking care of her baby dolls. She will read to them, feed and rock them with her lullaby CD playing, and at times, they are sitting in time out for being "naughty." I wonder where she heard that word!? This photo was taken when I went to check on her playing in her room. (She had the door shut.) When I opened the door, all of the babies were lined up on the floor with the diapers and wipes out. They were all getting their diapers changed! She is pretty good about not ruining new diapers as she puts them on her babies. However, the other day I noticed about 10 new ones in her trashcan...she said they were all dirty. She is the little mommy these days! Too Cute!! I love what these girls imaginations will do daily. Anna can't wait for you guys to come. She wants to show Laura her toys. I am sure there will be some dirty diapers!! Sweet! One of my favorites is when the girls are pretending to nurse their babies. Usually they are so serious about this too! Maryella says anytime someone asks her what she is going to be when she grows up "a mommy, a haircutter, and a doctor". I love that she says a mommy! I just pray that she forgets my "bad" mommy days and can take the good ones and let God lead her! Laura in "jammies"--how cute! I only see her in her "church clothes", as we call them.